Toni is an extremely experienced, versatile performer. Whatever you need, it can be done. Whether you are looking for an MC, a 5 - 10 minute high-skilled, energetic act to music, or a half hour comedy routine with jokes, tricks and audience participation, Toni can deliver. Skills and comedy - the perfect package! Suitable for outdoor or indoor events and street festivals. 15 - 45 mins long, tailored to your event. 2 x 2m performance area required. "Girl next door and professional world-class hula hooping with cheeky ‘just for mom’ comedy... Toni Smith leaves you chuckling while kids dance sweet ignorance!" Get your hoop on! Toni gives a short demonstration performance and an instructional lesson then provides plenty of hoops for your visitors to have a go at hula hooping with guidance. Guaranteed fun for old and young alike! Requires ample space for people to play. Classy and fun, this number is suitable for any environment; whether a corporate dinner function or a large expo or concert. Toni will wow you with her dexterity and timing. Performed to music. 6-10 minute duration, depending on requirements. Min 2 x 2 m stage. 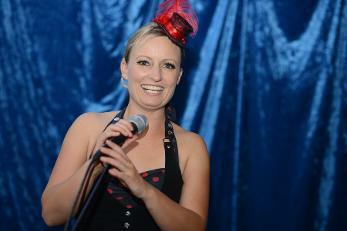 As a Master of Ceremonies, Toni will guide your event with confidence and comedy. Choose to have some special circus skills added or just a speaker to facilitate smooth transitions. Toni will dress accordingly to match your event, whether it's black tie or burlesque. Duration 6 - 10 mins. Min 2 x 2 m stage . A delightfully cheeky show with adult comedy and circus madness. Anything could happen when Toni takes the stage and audience members get involved… Highly entertaining and adaptable to suit any event, this one is just for the big people. 15 - 60 mins duration. Toni plays in the streets of Christchurch during a visit home after the damaging earthquakes, which destroyed her city .